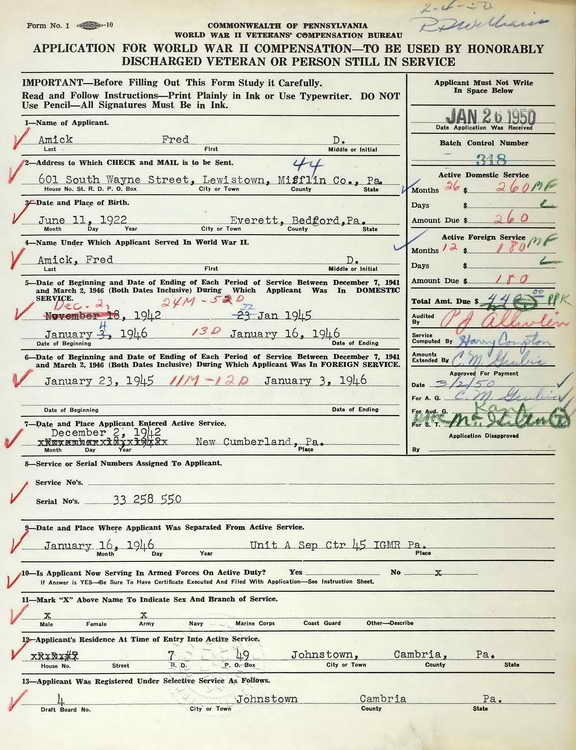 Pennsylvania WWII Veterans Compensation record for Fred D. Amick. Fred enlisted in the Army at Altoona, PA on 18 November 1943 but it was not until 13 February 1945 that T/5 Amick was transferred from the 3rd Replacement Depot to Company A, 508th PIR. T/5 Amick was awarded the Combat Infantryman badge for action during the Ardennes campaign, 18 Dec 1944 to 20 Feb 1945. He was discharged from Unit A, Separation Center, Indian Gap Military Reservation. PA on 16 January 1946.